Since 1931, South Farmingdale Water District has been providing clean, quality water to the communities we serve including South Farmingdale, North Massapequa, and parts of Bethpage, Seaford, and Massapequa Park. Our water is distributed via six plant sites and 11 water wells located throughout the geographic territories we serve. Water is drawn from aquifers located 400–600 feet below ground level and we maintain 3.2 million gallons of stored water in three in-ground tanks and one elevated tank (located at Plant No.1 Langdon Road). 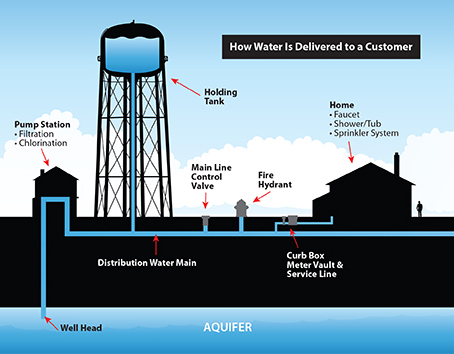 South Farmingdale Water District’s responsibility to our consumers is to maintain a seamless delivery of high quality water that meets all Federal, State and Local standards. Our water is monitored and tested routinely using the most stringent protocols available. SFWD’s Drinking Water Quality Report is available online, which includes a detailed water analysis. South Farmingdale Water District proudly serves 44,700 people and close to 13,000 accounts – 24 hours a day, 7 days a week, 365 days a year. If you are one of the many consumers who draw water from our 122-miles of networked water mains and pipelines, then you are experiencing quality water at its best each and every time you turn on your tap. With a daily pumping capacity of 20.5 million gallons, South Farmingdale Water District stands ready to provide clean, safe water every time you need it, whether you’re looking for a cool drink from the tap or running an extra load of laundry for the week. The District also promotes a strong conservation program and information for our consumers on different conservation practices to help protect our most precious natural resource. This also helps lower your annual water cost and makes for a more efficient delivery of water, without applying a tremendous amount of pressure on our water distribution system during peak pumping months. Of the 13,000 service connections within the District, five percent are commercial properties. South Farmingdale Water District works with environmental agencies on the State and Federal level as advisors and consultants to help protect local water supplies. We’ve provided guidelines that have helped to reduce costs and promote more efficient consumption.